ATM manufactures a tremendous selection of Short, Low, Medium, and High Power Terminations for Rectangular Waveguides that do not require Forced Air Cooling. 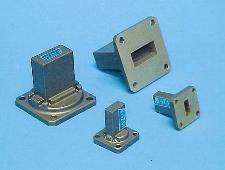 Double Ridge Waveguide Terminations are also available. 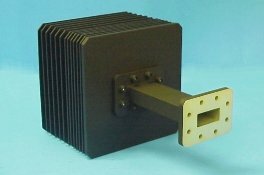 We offer a complete line of waveguide terminations in all waveguide sizes and power levels. Please call us and discuss your needs with one of our design engineers. • Full waveguide frequency range. • Units pressure tested to 10 PSI. Higher pressure is available upon request. • Finish is a unique corrosion-resistant 316 stainless steel epoxy coating. 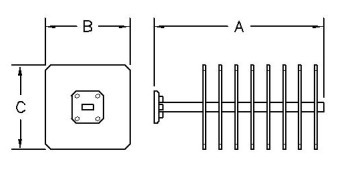 • Series 710 Terminations use Medium Power Elements to achieve low VSWR and stable electrical characteristics. 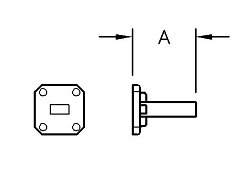 * The Standard Model Numbers above are the most common parts ordered for size, material and flange. However, these models can easily be altered for your needs by using the Model # code system at left. Note: All 745 series Terminations are aluminum construction only. • VSWR: See table below. 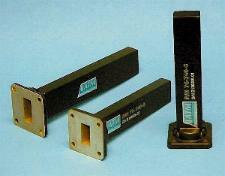 • ATM Series 720 Terminations use a precision conical element to achieve very low VSWR. Units pressure tested to 10 PSI. Higher pressure is available upon request. Series 740 Terminations utilizes High Power Ceramic Elements fired at 1300 C to achieve low VSWR and stable electrical characteristics. See VSWR ratings on table below. Units are best mounted in the horizontal plane with free air flow. The load temperature will vary depending on power levels and duration. 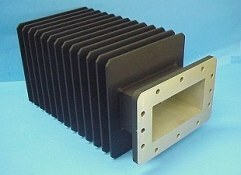 If during use the surface temperature approaches 260°C at the hottest point, (normally where the first fin touches the waveguide body), forced air cooling should be used to prevent damage to the internal load element. Units can survive temperatures as high as 450 °C without damage for a short time. VSWR: see rating on table below. 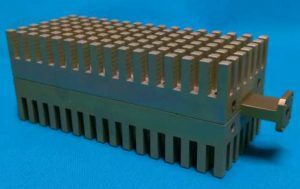 ATM Series 745 Terminations utilizes High Power Ceramic Elements fired at 1300 C for low VSWR and stable electrical characteristics. All series 745 Terminations are manufactured from 6061 Aluminum. 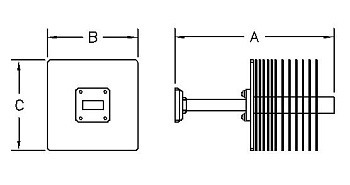 Series 760 Terminations are manufactured from 6061 Aluminum. ATM Series 760 Terminations utilizes High Power Ceramic Elements fired at 1300 C for low VSWR and stable electrical characteristics. VSWR: 1.10 typical, 1.15 max. 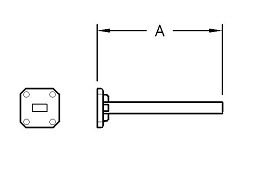 Series 780 Terminations are manufactured from 6061 Aluminum. 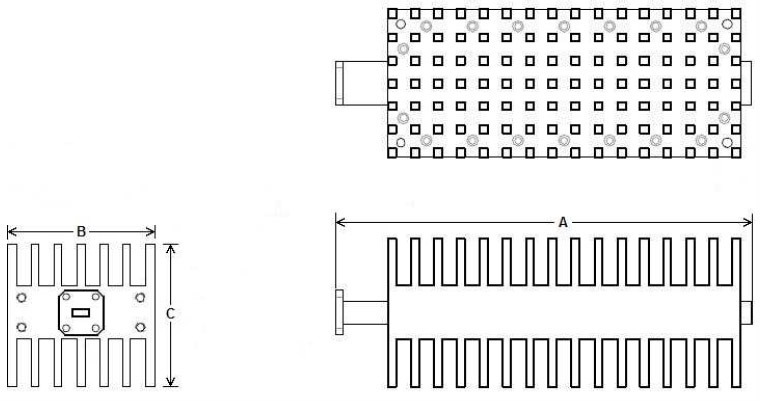 ATM Series 780 Terminations utilize High Power Ceramic Elements fired at 1300 C for low VSWR and stable electrical characteristics. 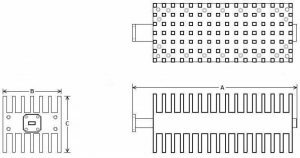 ATM Series 780 Terminations have specially designed elements that distribute the heat throughout the entire length of the unit to allow for much higher power specifications and uniform heat dissipation. For flanges other than shown, please contact the factory. Note: All 780 series terminations are aluminum construction only.